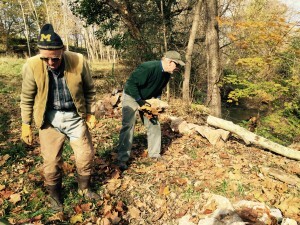 The Winchester Chapter of Trout Unlimited has been restoring a one mile section of Chapel Run, a spring-fed stream on Ellerslie Farm in Clarke County, since 1996. 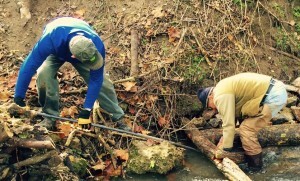 The efforts have been based on a deep-seated desire by our founding members to create a self-sustaining recreational trout fishery in the stream, which has water cold enough in the hot months of summer to support trout. And we’ve long known that the only way to do so was to overcome what is likely to have been a century or more of degradation from human impact. So this is a story of the effort to recreate the riffles and pools, as well as the bank protection and cover necessary to return Chapel Run to what it likely was in the far past: a stream capable of supporting naturally reproducing trout, one of the unique wonders created by nature.